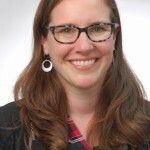 Amy Hurst is an accessibility researcher and an assistant professor in the Information Systems department at the University of Maryland Baltimore County (UMBC) where she founded the prototyping and design lab (the pad). She received her PhD in Human-Computer Interaction at Carnegie Mellon. Her research interests are centered around empowerment, and most of her projects explore engaging people with disabilities in the DIY / Maker movement and building software that automatically adapts to user needs.